Don’t worry about Bill finding out about this post because… I’m a child and already gave him his Christmas presents. Sigh – I can never wait! I’m so bad with gifts! I rather just give it to the person as soon as I get it. 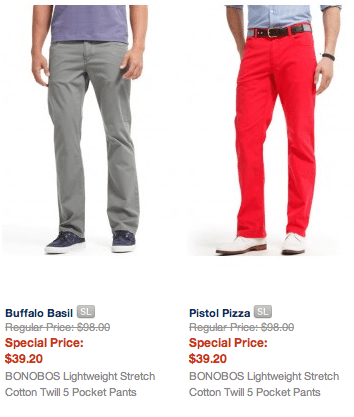 Anyway, during Cyber Monday, I found out about this amazing site – Bonobos. The site was 60% off and I lost my lid. I bought him 6 pairs of pants and saved a boat load of money. If you know my husband, you know that mint green pants are all the rage. This has become my new favorite man brand. Today, I received a mass email from the company’s CEO saying the site is once again on sale to make up for the down time they experienced during Cyber Monday. Well hello happiness!! 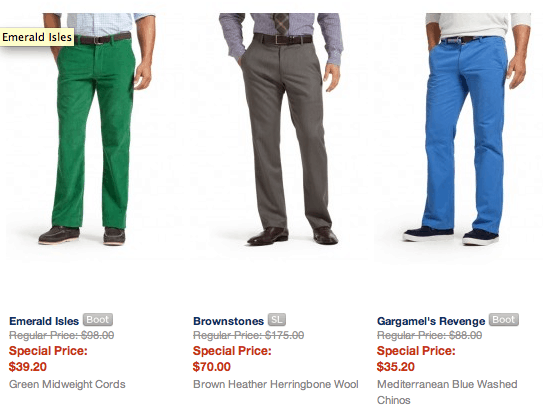 If you have a guy that you are shopping for, THIS IS THE SITE TO VISIT. TODAY! You crack me up! My daughter is the same way! Maybe you should have someone else shop for you and then bring the stuff over on Xmas Eve so you can’t give in sooner. But then you’d probably still tell him….. lol! !